Present state: The stationmaster's bungalow is in private occupation. The building has been extended at both ends in a similar style. Some restoration work has been undertaken; this includes the installation of a GWR style signal post and a replica running-in board, and replacement of the platform edge and brick-facing on the remaining section of the platform mound. There is also a replica 'totem' sign (Onny Gara) facing onto the road. facing the platform and the other facing the road. A bay window overlooked the platform with a post box set into the wall adjacent to the window, with the station clock above. An open-fronted waiting shelter with an overhanging canopy was attached to the north end of the building. The building was very similar to that at Eaton. Comparing the two 1:2,500 maps below the stationmaster's bungalow appears to have been replaced or extended between 1884 and 1902. At one time the station master was Eccles Lennox. 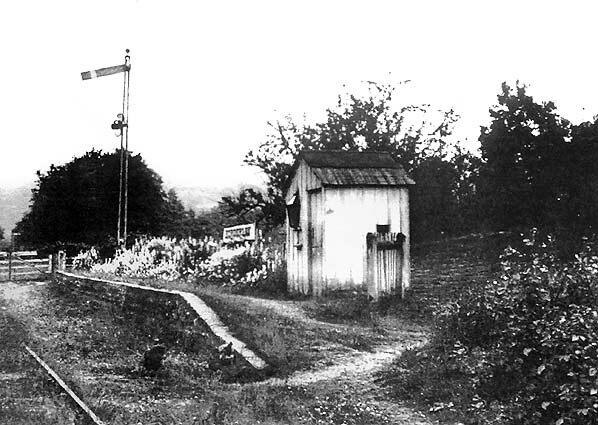 Access to the goods yard was on the east side of the bungalow where a weighbridge and a number of small huts were located. The station had only basic goods facilities and did not handle livestock. 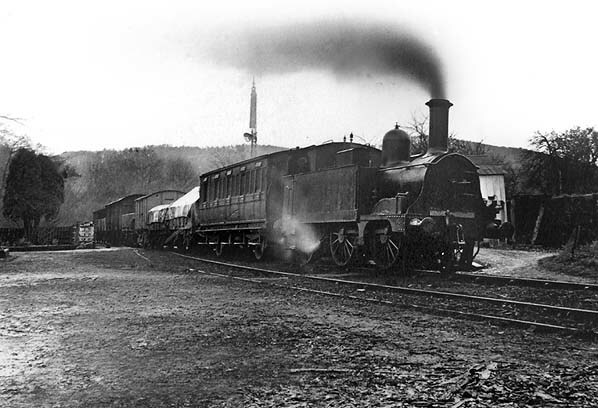 The loop acted as a siding for goods traffic. The bailiffs swooped on the railway near Horderley: workmen took out a couple of rails and built a fence across the track, blocking it and cutting off the rest of the line from the railway network. The bailiffs then sat down on the embankment and awaited developments. The impasse continued for about a week with residents of Bishop's Castle having to pay exorbitant prices for coal and other supplies brought in by road. To make matters worse, there were also a lot of LNWR wagons blocked in. The passenger service continued, however, with a shuttle operating between Bishop's Castle and Horderley, where passengers transferred to horse-drawn coaches to take them to Craven Arms. Tickets from Michael Stewart. except 59, 305, 327 & 1157 Brian Halford. Bradshaw and GWR timetable from Chris Totty. Route maps drawn by Alan Young. 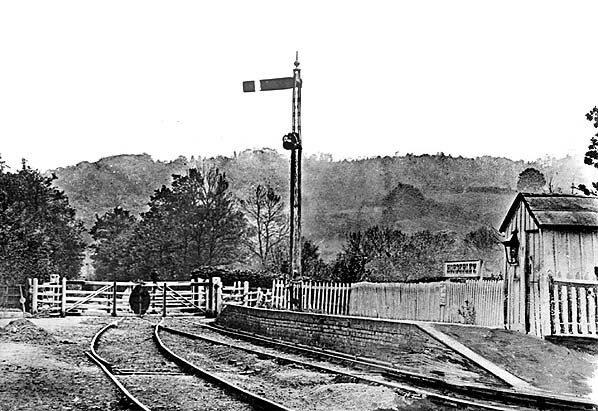 Horderley station looking south in 1906. The building on the right is the ticket hut. 1884 1:2,500 OS map; this shows the station as built. 1902 1:2,500 OS map. The stationmaster's bungalow has been replaced or extended. There is also a weighbridge which is not shown on the earlier map. 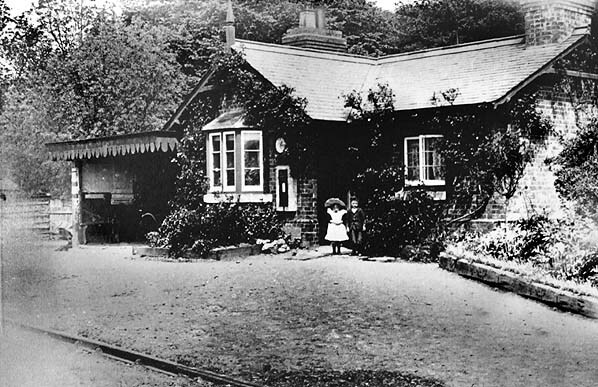 The stationmaster's bungalow and passenger waiting shelter at Horderley station seen from the platform in the early 20th century. out of view to the left. 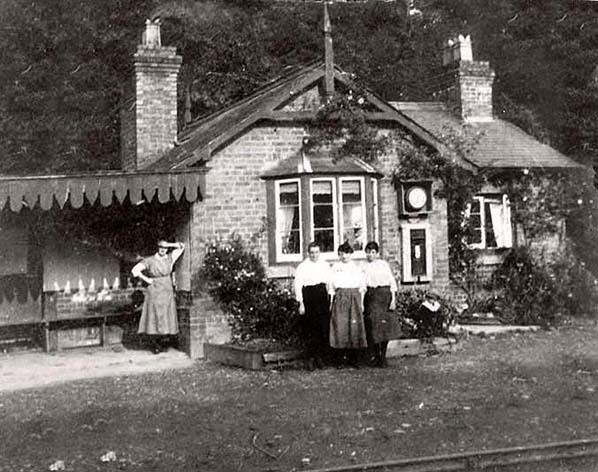 The stationmaster's bungalow in 1909. There is a waiting shelter at the north end of the building. The ticket hut was at the north end of the platform. Passengers wanting to board a train had to cross the tracks and walk up the platform ramp. The bay window allowed the stationmaster to look out over the station and goods yard. 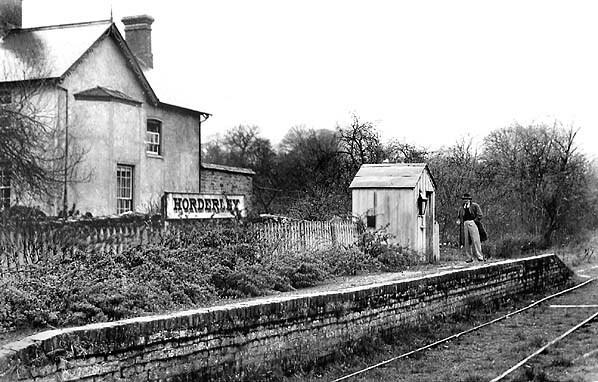 A mixed train stands at Horderley station in the first decade of the 20th century. The Bishop's Castle Railway had two locomotives, 'Carlisle' and No. 1; this is No. 1. The loco was built by the GWR at Wolverhampton works in 1869. It was a small 0-4-2T tank engine (517 class) designed by George Armstrong for local passenger work on the Great Western Railway and carried the GWR No. 567. After closure of the BCR, No.1 (Tanky) was put into a siding at Plowden to await cutting up. The 517 class became extinct in 1945. 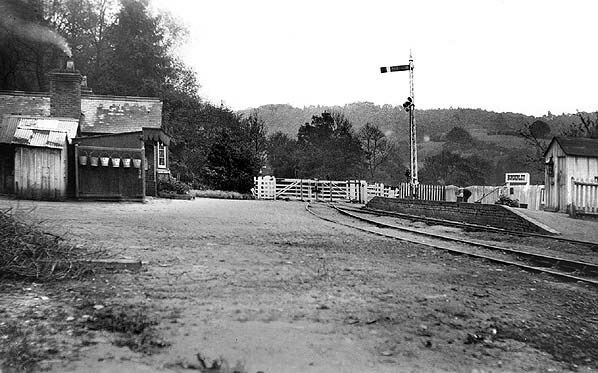 Horderley station looking south in August 1932. Many tons of stone (seen here) from the Squilver Quarry were transported by the BCR from Lydham Heath to Plowden and Horderley. A lone well dressed passenger waits at Horderley station in 1932. Although the station remained open for three more years it was already suffering from a lack of maintenance. With only one passenger coach in use it was necessary to keep only the north end of the platform clear of vegetation. The house to the rear of the platform has no connection with the railway. 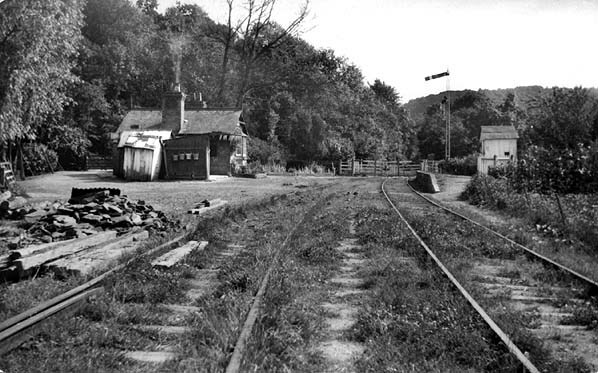 Horderley station looking south, probably in 1935 a few months after closure. The track bed is now overgrown and unusable. 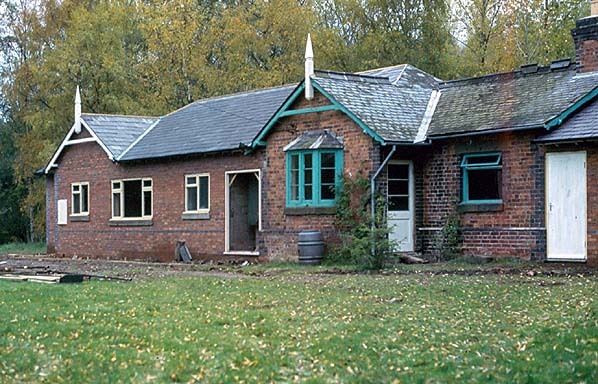 Horderley stationmaster's bungalow in November 1979 during building of the extension. Only the central section of the building with the green painted window frames is original. 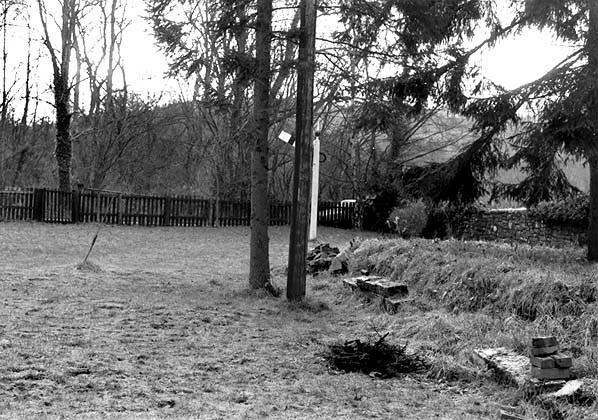 The earth mound on the right is all that remained of the passenger platform at Horderley in May 1985. The signal post is not original. 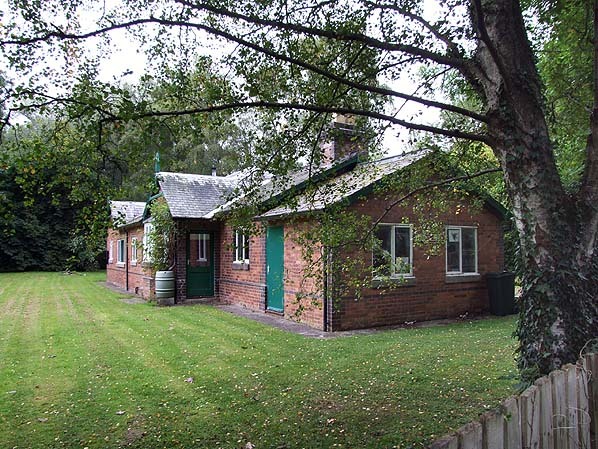 Horderley stationmaster's bungalow in September 2009. The building has been extended at both ends in a similar style. There is a short extension in the foreground (with a slightly lower roof) with a longer extension and a second gable at the rear on the site of the waiting shelter and the goods yard buildings. Horderley station platform in September 2009. 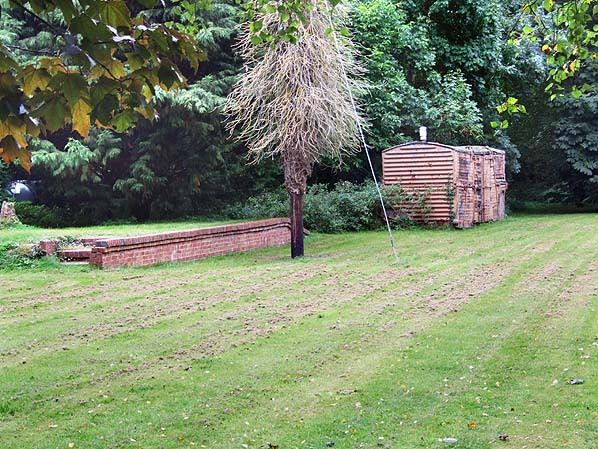 The platform edge and brick-facing have been reinstated on the remaining section of platform mound by the Bishop's Castle Railway Society.